The 70-million-year-old remains of an enormous flying predator that feasted on baby dinosaurs have been discovered in Mongolia. The flesh-eating reptile, which was the size of a small plane with a wingspan stretching 11 metres (36ft), was likely one of the largest animals ever to fly. It could have walked on all fours using its wings as front limbs to stalk prey on the ground, researchers said, and would have stood as tall as a giraffe. Because of its size, the new carnivore is thought to have eaten juvenile or small dinosaurs, which were common during the Late Cretaceous period when the animal lived. The fossil was found in a region of Mongolia’s Gobi desert known as the Nemegt Formation, an area where many dinosaur bones have been found before. The animals were the first vertebrates known to evolve the power of flight, and are thought to have been the largest flying animals ever seen on Earth. While the species unearthed in Mongolia has not yet been identified, researchers were struck by the sheer size of the backbone fragments found. ‘I immediately recognised that it might be a pterosaur and was astonished at its gigantic size,’ palaeontologist Dr Takanobu Tsuihiji from the University of Tokyo told National Geographic. 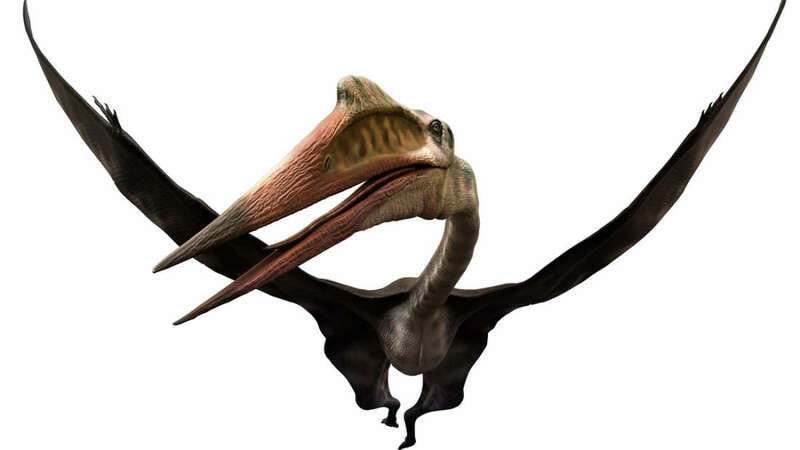 Based on the eight-inch (20cm) width of the backbone fragments found, the researchers claim the animal would have been similar in size to the two largest known species of pterosaur. The huge predators Quetzalcoatlus and Hatzegopteryx probably had wingspans of 10 metres (32ft) and 11 metres (36ft) respectively. This is the first time the famed Nemegt Formation fossil patch has yielded a pterosaur, showing how far-reaching the group was in the Late Cretaceous period. ‘Although fragmentary, the specimen is from a gigantic individual… extending the geographic range of gigantic pterosaurs to Asia,’ the researchers wrote in their paper. Palaeontologists with the Mongolian Academy of Sciences first discovered the bones in 2006. They sent the fossil to the University of Tokyo for further analysis before a re-examination of the site uncovered more remains. But many of the bones were broken into tiny fragments, meaning it took researchers years to piece them back together. Once they had pieced the fragments back together, the team were left with several backbones from a rare group of pterosaurs known as azhdarchids. ‘Whether that equates to a totally new size class of pterosaur is another question,’ palaeontologist and pterosaur expert Dr Mark Witton from the University of Portsmouth, who wasn’t involved in the study, told National Geographic. Despite this lack of evidence, Dr Witton said the animals likely had a large enough wingspan to push the physical limit for flying in an animal of this size.